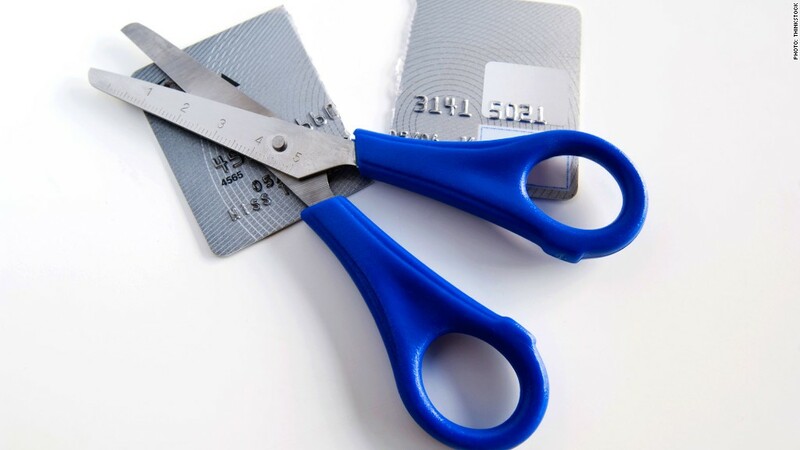 Younger Americans are cutting up their credit cards and relying on debit or prepaid cards instead. The number of young Americans who are living without credit cards has doubled since the recession, according to new research. About 16% of consumers ages 18 to 29 didn't have a single credit card by the end of 2012 -- up from 8% in 2007, according to data that credit score provider FICO collected from the credit files of millions of consumers. As a result, credit card debt has declined by about a third among this age group -- from an average $3,073 to $2,087 per person. After watching older generations -- like their parents -- get hit hard by the recession, many younger Americans are shying away from credit and opting for debit cards instead, according to FICO. Prepaid cards have also become attractive alternatives, said John Ulzheimer, president of consumer education at SmartCredit.com. Related: Recession ended 4 years ago: How far have we come? "[T]here has been very aggressive marketing of prepaid debit cards over the past few years targeting young people and minorities," he said. "So it's not a surprise that more young people are using prepaid debit cards over credit cards." In addition, the CARD Act, which took effect in 2010 and requires consumers under age 21 to have a co-signer or to earn enough income to make full payments, has also made it harder for this group to qualify for credit cards, FICO found. Along with credit card debt, overall debt has fallen among this younger group. Even with the surge in student loan debt, this younger group has seen an even more rapid decline in other debts like mortgages. And this shedding of debt has translated into higher credit scores, with the number of consumers 18 to 29 years old with excellent FICO scores of 760 or higher jumping from 8.6% in 2005 to 11.2% last year. Older Americans are another story, however. While they also lowered their credit card debt, they racked up more auto and mortgage debt. Consumers 40 and over therefore have more overall debt today than they did in 2005. And as a result, FICO scores have fallen 1.7 percentage points among the 40 to 49 age group, 1.8 percentage points for those ages 50 to 59 and 3.8 percentage points for consumers 60 and older. "[P]arents are having to take on more debt to help their kids make ends meet," said Ulzheimer. "And, thanks again to the CARD Act, more parents are being asked to co-sign for their younger non-working children who want a credit card."